For adults, take two (2) capsules daily, preferably before workouts. As a reminder, discuss the supplements and medications you take with your health care providers. Use in conjunction with an intense daily exercise program and a balanced diet including an adequate caloric intake. Not intended for use by pregnant or nursing women. If you are taking any medications or have nay medical condition, consult your doctor before use. Avoid this product if you have kidney disease. Discontinue use and consult your doctor if any adverse reactions occur. Not intended for use by persons under the age of 18. Stacked Savings! Get additional savings when you purchase Military Trainer StackPromotional savings will NOT apply when each item is added to the cart individually. Torabolic with Quik-Creat - your new PR in a bottle! 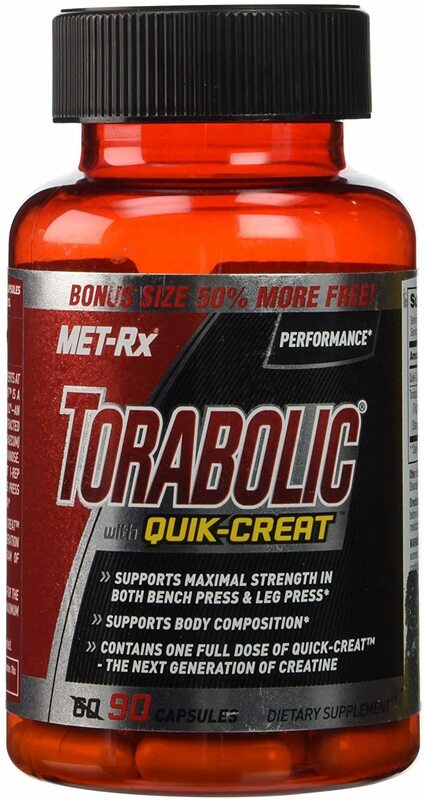 Torabolic with Quik-Creat is a revolutionary product featuring Torabolic – an innovative and powerful ingredient extracted from Fenugreek (trigonella foenun greacum) seeds, standardized to 70% trigimannose. Non-standardized inferior forms may not provide the same benefits. Torabolic is derived from the seeds of an herb known as Fenugreek. Fenugreek, also known as Trigonella foenum graecum, has a long history of traditional use in countries such as India and China. One of the active ingredients believed to contribute to Fenugreeks benefits is known as trigimannose, which is why Torabolic is standardized to contain 70% trigimannose per serving. In addition to Fenugreeks traditional use for sugar metabolism, animal studies suggest that it may have benefits for exercise performance. Based on this knowledge, researchers from the University of Mary Hardin-Baylor decided to see if the benefits of Fenugreek in animals could translate over to humans when using a standardized preparation. If you’ve tried other products in the past and only achieved lackluster results, give Torabolic a try for 8 weeks. Combined with a solid training and nutrition program, this breakthrough ingredient can have you on your way to the results you’ve been looking for. Torabolic can also be a great complement to other supplements in your arsenal such as Protein and a daily Multivitamin.